A motorized Wavewalk® 500 or 700 can travel at high speeds. While spray splashing into the cockpit isn’t a problem in normal conditions, spray might splash into the front part of the cockpit when the water is choppy and the kayak’s bow hits waves at high speed. This problem can be solved by outfitting the front of the cockpit with a cover such as a small tarp. 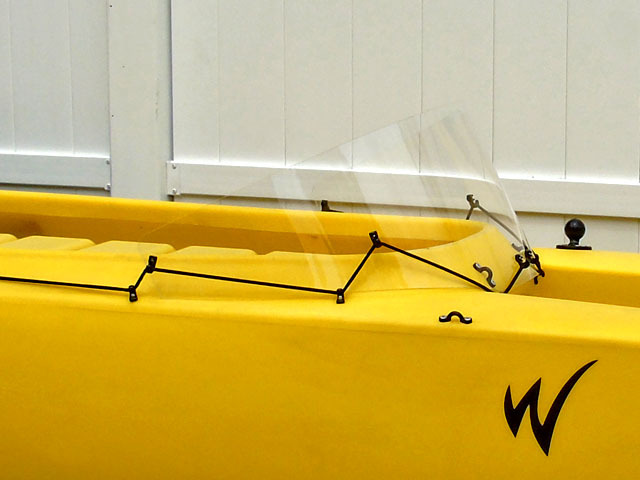 The Spray Shield can offer similar protection, and it’s attached to the kayak by means of lashing hooks and a shock cord (bungee). 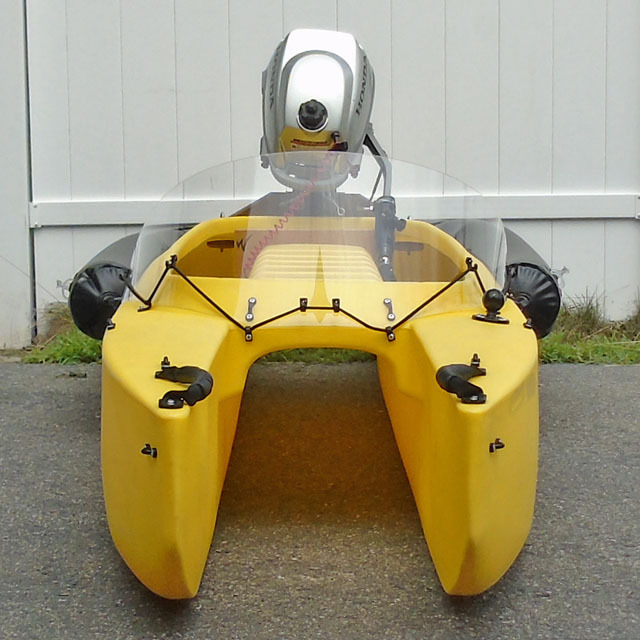 The Detachable Spray Shield can be attached to the kayak while a cockpit cover is attached to it as well, thus providing double protection. We don’t ship this product separately from our kayaks. Hold the Spray Shield with the hooks facing outward (away from you) and downward. Move to the front of the cockpit, and place the Spray Shield before the spray deflector’s front end. Lift the bungee in the front, and bring it over the shield’s two front hooks, as seen in the above pictures. 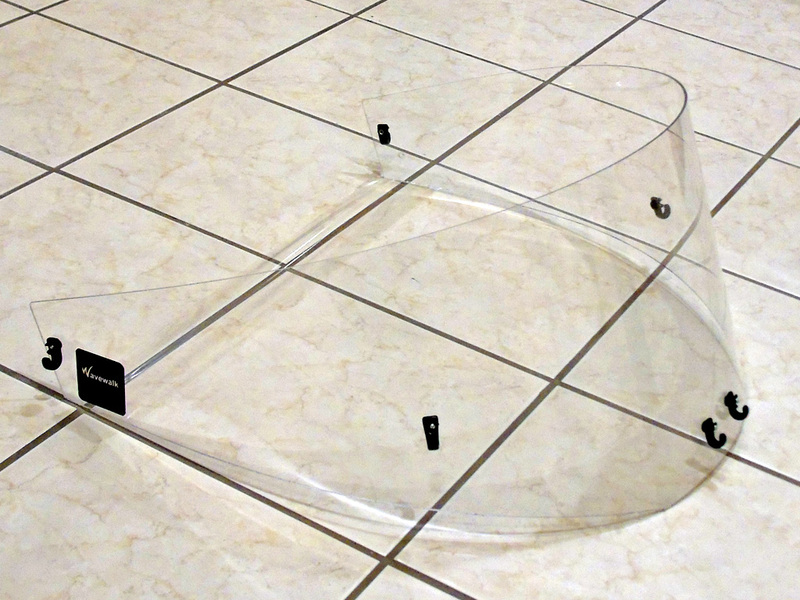 Pull the sides of the shield towards you until they fit shape of the cockpit’s front end, and attach them using the bungee in the same way (see pictures). To make the bungee tighter you can shorten it. When not attached, the Spray Shield is flat, and it fits easily in one of the hull tips behind you – Just slide it inside. The end will protrude from the hull tip, but not enough to bother you. 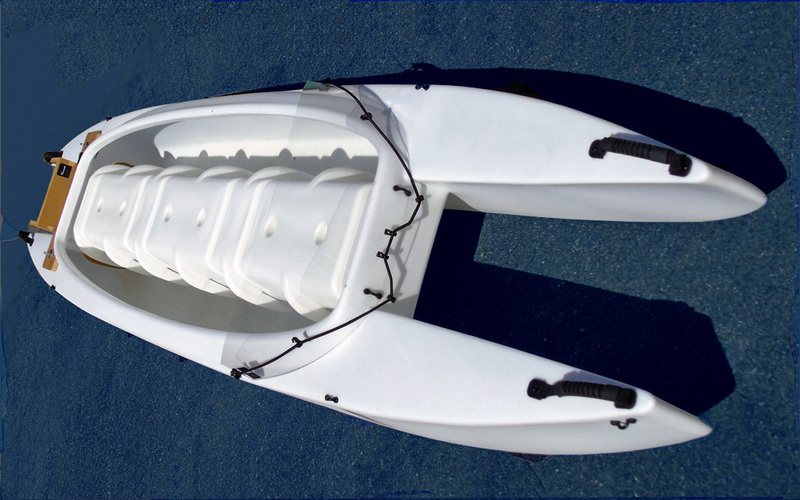 Well there you go… The absolute PERFECT kayak setup! Very cleanly designed package Yoav! The fact that everything is easily removed increases its value. Amazing! Great job. Looks neat… when outfitted with it the w doesn’t look like a kayak at all… but do I need one for motorized kayaking on a small lake? It’s definitely not an absolute must. Benny, it’s not meant for use by W paddlers. It’s meant to serve only users who motorize in the ocean or in moving water, or in very choppy water.